Murray B. Bornstein, MD (DC '39) was a renowned clinician and researcher in the field of multiple sclerosis and a former adjunct professor at Dartmouth's medical school. This endowed professorship was established with a generous gift to the Geisel School of Medicine by the family of Murray B. Bornstein, MD (DC ’39), a renowned clinician and researcher in the field of multiple sclerosis and a former adjunct professor at Dartmouth’s medical school. 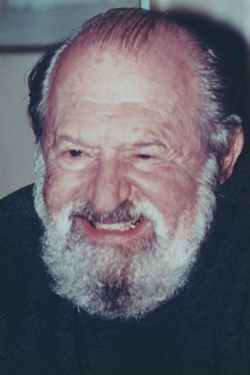 Bornstein is best known for pioneering a tissue-culture technique for diseases of the central nervous system and for leading several exemplary clinical trials for multiple sclerosis treatment. His work continues to benefit patients, as he was integral in the testing and approval of glatiramer acetate (GA), the most commonly used drug for treating multiple sclerosis in the U.S.
“It is an honor to be selected as the first Murray B. Bornstein Professor at Geisel,” said Pachner. “Along with his large body of work in the research lab, Dr. Bornstein was a compassionate and highly skilled clinician. I will try as best I can to emulate him as a researcher, clinician, and leader in neurology." Pachner is a professor in the Department of Neurology at Geisel and director of the Multiple Sclerosis Center at Dartmouth-Hitchcock. Prior to joining Dartmouth in 2012, he served on the faculty at the University of Medicine and Dentistry of New Jersey, Georgetown University School of Medicine, and Yale University School of Medicine. He has been a principal investigator for many industry and government-sponsored clinical trials and research projects in multiple sclerosis and its models, Lyme neuroborreliosis and myasthenia gravis. Pachner received his undergraduate and medical degrees at Yale and completed his internship and assistant residency in internal medicine at Johns Hopkins Hospital in Baltimore, Md. His training also includes a fellowship and chief residency in neurology at Yale-New Haven Hospital. He was born and raised in the Chicago area and currently resides in Norwich, Vt.
Kate Villars is Director of Communications for the Office of Development and Alumni Relations at the Geisel School of Medicine at Dartmouth.